These Terms and Conditions will apply to all sales made by Delta Membranes Systems Ltd (The Company) unless specific variations have been agreed in writing. The Company reserves the right to alter its Terms and Conditions of trading without prior notice, so each time you order our goods you should satisfy yourself that you are placing the order on the basis of our correct Terms and Conditions. Our Terms and Conditions of sale can be found on our website (www.deltamembranes.com) and will be updated from time to time. The Company cannot accept responsibility for misinterpretation and inaccuracies, or omissions of any Specifications, Drawings, Bills of Quantities or other information supplied by the Purchaser. All goods are quoted subject to availability. (i) The Company does not guarantee to deliver within the specified time as the carriers are not under the company’s direct control. The Company will use its best endeavors to deliver orders within 48 hours (mainland UK only), and other destinations as quoted. (ii) All times and dates of deliveries specified herein are estimates and are not deemed to the essence of the contract. Whilst we will use its best endeavors to execute the order by the time or dates specified herein, we will not be liable for any direct or consequential losses arising therefrom due to delays in delivering materials. The Company uses public carriers to deliver its goods. Carriage charges are made in addition to the purchase price of the goods. The Company will advise the Purchaser of the carriage charges appropriate to the order when the Purchaser orders. These charges are not within The Company’s control and may vary from time to time. Notwithstanding delivery of any Goods, the title and property in the Goods shall remain vested in Delta Membrane Systems Ltd until all sums due from the BUYER have been paid in full. Powder and liquids if unused are subject to 7 day a return policy, membranes and ancillaries if unused will be subject to a 28- day return policy. All returned items will be subject to return carriage and 15% restocking charge. Due to Bespoke Sump/pump stations being manufactured specific to your requirements they are non-refundable and will not be accepted as a return item. Prices are subject to alteration without any prior notice in the event of changes in market conditions, rates of exchange, manufacturer’s price changes and any other factor outside our control. Invoice prices are net and those ruling at the date. All prices are quoted exclusive of added tax. Value Added Tax (VAT) will be charged at the current rate ruling on the date the goods are dispatched. Verbal or written quotations are valid for 28 days. Our standard payment terms are cleared payment at time of purchase. Credit facilities are subject to status and following credit checks from a third -party credit reference agency. Subject to these references and any other relevant information, an account facility may be offered with a credit limit. Credit facility accounts are not available on first purchases. For credit account customers, paying in full must be received by The Company by the 30th day after the month of invoice. Where part of any account becomes overdue, the whole of the account, whether due or not, becomes payable immediately. The Company reserves the right to charge interest pro-rata on all outstanding debits at any time after the date on which they become due. Each delivery shall be considered a separate Contract which is subject to these Terms and Conditions of Sale. Failure to deliver for any reason shall not make Terms and Conditions of Sale void. All goods shall be at the Purchaser’s risk as soon as they are delivered to the Purchaser by The Company or collected by the Purchaser from an agreed point of collection. Warranty claims for pump and mechanical products are subject to a third-party manufacture warranty and are not included under the Delta Membrane Systems Ltd Product Warranty Policy. In the event of an account becoming overdue, The Company reserves the right to withhold further supplies until such and overdue amount is settled in full. All goods must be examined at the time of delivery and any loss or damage entered on the carrier’s delivery note. It is essential that all claims for damage of loss be notified to The Company in writing within three working days from the date of delivery. Where the delivery has been made by the carriers or by the post office, they must also be notified by the customer in writing within three working days from the date of delivery. Packaging materials and damaged goods must be returned retained for inspection. Non-delivery of goods must be notified in writing to The Company within seven days of the invoice date. Any terms and conditions of sale which the Purchaser may not purport to impose shall form no part of the Contract between the Purchaser and The Company. None of The Company employees or agents has any authority to bind The Company by oral agreement at variance with these Terms and Conditions of Trading. Any variance must be in writing. 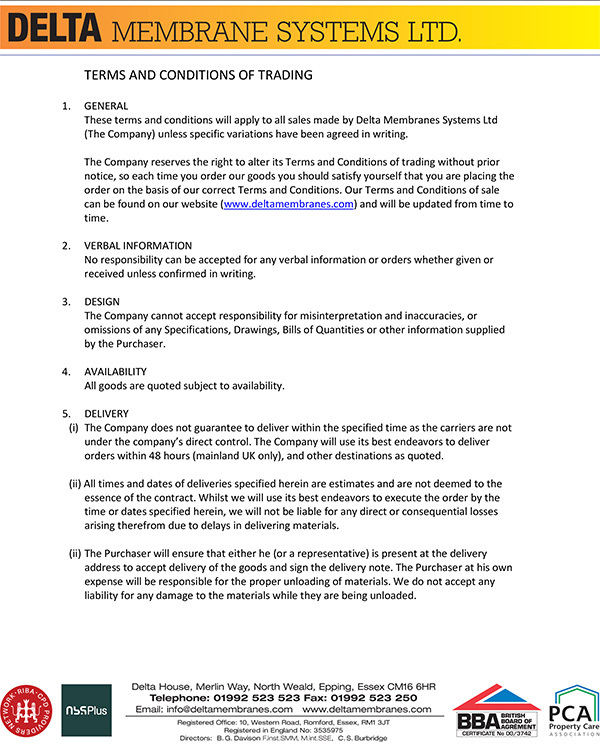 These Terms and Conditions and any dispute or claim arising out of or in connection with it or its subject matter or formation (including non-contractual disputes or claims) shall be governed by and construed in accordance with English Law and the parties submit to the exclusive jurisdiction of the English Courts Search Terms & Conditions Delivery Details.